If you want to enjoy your Halloween by creeping it real without burying your budget alive, you’ll need to think ahead. Follow these lucky 13 tips—with a few sweet quotes from EveryDollar budgeters sprinkled in—to keep your spending out of double, double toil and trouble this year. 1. Set a Halloween budget. Before you shop at all—budget. Decide a reasonable amount to spend, and don’t waver from it. “Set a limit for costumes, candy and party goods—and don’t even think about putting it on a credit card, or else the trick is on you.” — Mona P.
2. Wait for sales to buy your Halloween candy. The second you spot your first pumpkin stand, we know what you’re thinking, The trick-or-treaters are coming. We have to stock up. NOW! But you don’t. Yet. Yes, you need candy. You want to hand out the treats so you don’t get the tricks. But you should wait for the sales. Publix has BOGO, Target has one-day Cartwheel promotions, and Kroger has sales for Shopper’s Card holders. So wait it out for the best deals. 3. Visit consignment or thrift stores. “Growing up, my mom would take us to a thrift store each year for the staples of our costumes. One time, I was determined to be Ace Ventura. We went to Goodwill, and sure enough, I found some incredibly hideous striped pants, a white men's tank top. And really, the outfit made itself after that!” — Krista D.
Who said new was best? Probably a marketing campaign aimed at Halloween costume shoppers. But you know better. Gently used clothes make for great and affordable wear-one-time costume pieces. And if you’re going as a zombie—that well-worn pair of khakis with the red ink stains is the best buy around. 4. Even better—shop your closet! Before you start buying, shop your closets. That green knee-length dress is just what you need to be Lady Link from Zelda. Poke the lenses out of those 3D movie glasses you kept and pull out the suspenders your grandpa gave you—and you’ve got about half of your “Smarties Pants” costume ready. All that’s left to do is hot glue the candy onto an old pair of jeans. Get it? Punny. It’s okay to buy costumes from the store, but you can also make used or already-owned items work splendidly if you’re wanting to celebrate with less spending this year. 5. Stock up for Christmas with post-Halloween candy sales. 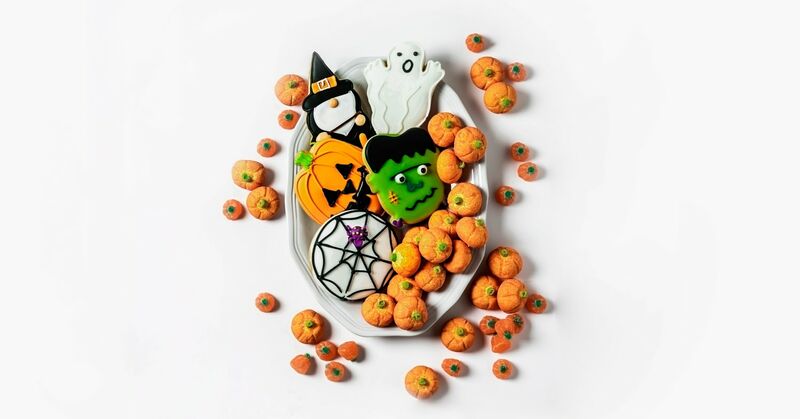 “The day after Halloween—stock up on candy and chocolate for Christmas baking!” — Melanie H.
Heck yes, Melanie! Did you know orange and black wrapped candies taste the same as regularly wrapped candies? So, nab all the non-skeleton-covered sweets you need to fill Christmas stockings. Or go for the spooky-themed ones and tell the kids Santa went Goth. Want to become the dentist’s BFF? Go trick-or-treating and get more fun-sized candy than any little mouth should ever chew. If your little one is too young to notice, you can move some of the sweets to a nice hiding spot—again for stockings in about two short months. Or eat them yourself. There’s no judgement here. 7. Make your own costume. Pull out your sewing machine and pull a Project Runway this year. Marks for creativity! Not only does it cost less, but it also makes an impression. Anyone can purchase a store-bought costume. It takes a real outfit ace to take something from concept to completion all on their own. Wow everyone and save your budget. “Buy fake pumpkins so you don’t have to keep buying and carving new ones every year.” — Linda S.
Okay, we know Linda lost some of you there. If pumpkin-carving contests are the highlight of Halloween for your family, then real pumpkins should have a spot in your budget. And that’s fine. That’s what a budget is for—to help you prioritize your spending. But for those who always end up making a jack-o-lantern look like a gross extra from a horror flick. . .this is the tip for you! Keep your hands clean and save money in the long run by using fake pumpkins. 9. Recycle last year’s costume. “Once our kids started earning commissions and establishing savings goals, I told them I would pay them $2 to wear last year’s costumes again. It worked—and I saved $50!” — Jamie H.
The same thinking could work for encouraging younger siblings to use a hand-me-down costume from an older sibling. 10. Sell your old costumes. Instead of swapping or re-wearing, sell your old costumes! Plenty of like-minded, frugal shoppers would love to get a deal on something you wore once, because they’ll only wear it once. See the cycle? Make it a cycle of savings. 11. Buy reduced costumes after the holiday. Want to think ahead? When Halloween is over, candy isn’t the only thing reduced. Buy your kids some costumes for next year, one size up! Maybe you’re worried you can’t pinpoint what your kids will be into next year. However, you can guess what they’ll still love two months from now, so what if you did some early Christmas shopping and bought them a reduced-price princess or superhero costume as a dress-up outfit? Now you’re getting stuff under the tree at a reduced fee! You went from Boo to Ho, Ho, Ho in one day. Bravo. 12. Attend free community events. “Take advantage of free community events!” — Alisa J. We couldn’t agree with you more, Alisa. Churches and communities offer lots of autumnal activities. Trunk-or-treats, fall fests, art walks, and chili cookoffs: get in on the free fun that’s right in your community’s backyard! 13. Check out dollar stores for décor. You don’t have to spend a grave amount on decorations. Go to your local everything’s-a-dollar store and buy all your menacing, monster, maniacal, moonlight and magic needs. From tableware to front porch scares, you can make a truly terrifying impact on a tiny budget. The only thing hair raising this holiday should be the creepy clown costumes—not the costs. Create a free budget with EveryDollar today to plan and track your Halloween spending.